Why on earth would someone have an egg white omelet to increase their health? If you think eggs are loaded with cholesterol or are trying to reduce your calories, you might think again after reading the facts. "Eggs do not increase the risk of cardiovascular disease and can be safely consumed"
When we eat foods that contain a high amount of dietary cholesterol such as eggs, our body down-regulates its internal production of cholesterol to balance things out. If you don’t eat enough, your body simply produces is. About 80% of cholesterol is created from our own body. We vitally NEED it to function properly. 2. Extra Calories an Issue? Eggs contain about 70 calories. Since the yolks have such a high micronutrient density in those calories, it increases your overall nutrient density per calorie you consume. This helps you regulate your appetite for the remainder of the day. You will EAT LESS when you have better food to fuel your body. The extra fats (healthy fats) and calories from the yolk are so nutrient-dense that they increase your body’s ability to burn fat. Now, this should MAKE you want to eat the yolk. Ditch calories someplace else, like your nutritionally-lacking foo-foo coffee or packaged carbohydrate snack. According to a local farmer, Erin Engelbrecht from Engelbrecht Farms in Donahue, Iowa, the typical cheap grocery store eggs will have lower nutrient levels because they can be stored for up to 9 months before they sell. That is crazy long. The longer they are stored the more nutrients they lose. 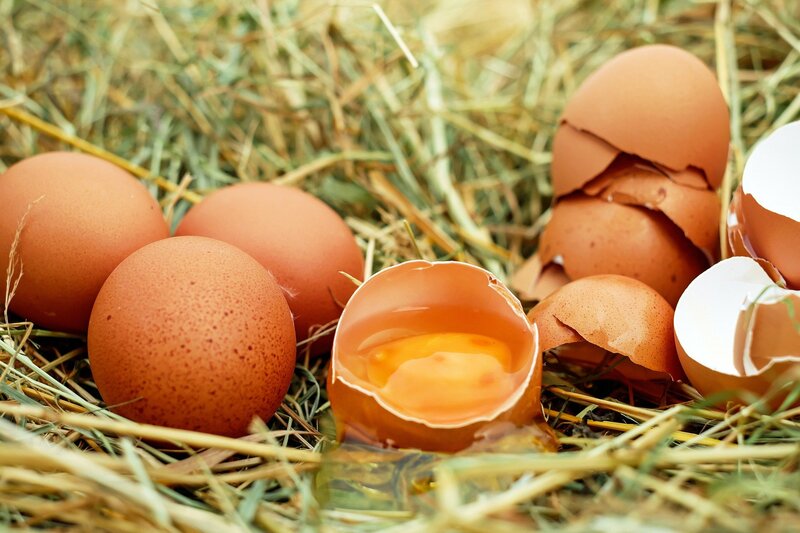 cage-free organic eggs from healthier chickens allowed to eat more natural feed and roam freely will have much higher vitamin and mineral levels and a more balanced healthier omega-3 to omega-6 fatty acid ratio. Erin’s cage-free eggs are healthier chickens because they are allowed to roam and eat more natural feed with higher vitamin and mineral levels. I recently compared eggs from the grocery store with eggs from her farm. Her eggs were most likely the same type of chicken – we tried. Some chickens lay different types of eggs, but the interesting part was, the fresher the egg, the thicker the thicker the shell wall and darker the yoke. The ones from the store were thinner and had a lighter yoke. There were other differences too. A free-roaming hen allowed to roam will eat a variety of greens, insects, worms, etc transferring MUCH higher levels of nutrients to the eggs compared one that is trapped inside a dark factory farm hen house and fed nothing but piles of corn and soy. When I eat eggs in the morning I stay fuller longer – this is when I eat the entire egg. When I eat egg white omelets, even with veggies, I am super hungry in less than 2 hours. This is because I’m not eating enough calories and not getting enough nutrients. Egg eaters actually consume fewer calories during the day, than those who eat cereal or bagels and lost weight (source). Egg Whites: 17 calories. 4 grams of protein, 55 mg of sodium. 1.3 micrograms of folate, 6.6 mcg of selenium, 2.3 mg of calcium, 3.6 mg of magnesium, and 4.9 mg of phosphorus and 53.8 mg of potassium. This seems like a lot, but it’s in MG…meaning a trace amount. They are and are devoid of nutrition compared to the yolks. Egg Yokes: 55 calories. The most nutrient dense and antioxidant- rich part of the egg with; choline, folate, lutein(helps protect from inflammation), contain more than 90% of the calcium, iron, phosphorus, zinc, thiamin, B6, folate, and B12, and pantothenic acid, ALL of the fat soluble vitamins A, D, E, and K, as well as ALL of the essential fatty acids (EFAs) from free-range eggs. 4.5 grams of total fat and 1.6 grams of saturated fat, 210 mg of cholesterol, 8 mg of sodium, and 2.7 grams of protein.